Butch Lincoln played basketball at UAA and graduated from the school, and now he's chief operating officer of Arctic Slope Regional Corporation. Toby Schwoerer was an All-American nordic skier and cross-country runner at UAA, and now the Seawolf Hall of Famer is a senior researcher for UAA's Institute of Social and Economic Research. And a kid can hardly grow up in this town playing hockey without being coached by former Seawolves, who have stayed in Anchorage as teachers, firefighters, cops, corrections officers and bankers. With legislative funding for the University of Alaska expected to keep falling and more budget cuts looming that threaten athletic programs at UAA, coaches, athletes, alumni and supporters at a campus forum Wednesday heralded Seawolves sports as a vital component of the community. They described UAA athletics as glue that binds and fortifies the community, furnishes the school identity and burnishes its profile. "The return in your investment in our programs has been paying dividends for years,'' UAA ski coach Sparky Anderson told UA president Jim Johnsen. Johnsen listened to nearly 30 people. Most spoke about the impact of UAA sports in Anchorage and how those sports produce leaders who remain in Alaska and strengthen it. Some supporters wore "Save the Seawolves" T-shirts. It's not just athletics feeling the pinch. The university's Strategic Pathways review team evaluated six other areas: teacher education, management and business, engineering, information technology, procurement and research administration. Its reports discuss pros and cons of different options for each area, including merging departments across campuses. But these reports have generated far less public outcry than the threat to athletics. Johnsen is making the rounds to talk about potential cuts and consolidations. He appeared last week at a forum at UAF , has another scheduled next week at UAS, and next week in Juneau will give the UA Board of Regents an outline of options. The Board is expected to make decisions in November. "We have challenges, right? Our state is in a tough, tough spot fiscally,'' Johnsen said in his opening remarks. "You all know that. But as our state goes, so do we at the University of Alaska. Johnsen said UA already has cut more than 500 faculty and staff members this year and reduced academic programs to 445 from 478. He said UA budgeted for $377 million in state funding and got $325 million from the Legislature, hence the need for budget cuts of nearly 14 percent. "We're under a lot of pressure,'' he said. For UAA sports, a review team presented three options, two of which would eliminate hockey — the athletic department's biggest spender, at $1.9 million last school year — as well as skiing and gymnastics. One option is whacking sports at UAA and UAF entirely. Another option is killing Division I sports, which at UAA would eliminate hockey, skiing and gymnastics. The third option, consolidated athletics linking UAA and UAF, is unprecedented in NCAA history for two schools separated by such a geographic distance and would require NCAA approval. After the forum, Johnson said the three options presented by the review team are not the only choices. The Board of Regents, he said, can go another route. In his remarks Wednesday, Seawolves men's basketball coach Rusty Osborne, in his 26th season at the school, invoked the cumulative 3.24 grade-point average of UAA athletes last school year. "It means that our kids are in the classroom pushing other students to be successful,'' Osborne said. Others who spoke emphasized the 2,600 hours of community service Seawolves athletes contributed last school year and credited sports for adding diversity to UAA's campus. Senior hockey player Chase Van Allen of Anchorage said attending UAA has made him realize he wants to serve a community that has aided him. "With that degree, I can give back to the community that that has done so much for me, not just hockey, but the Anchorage community as a whole,'' Van Allen said. 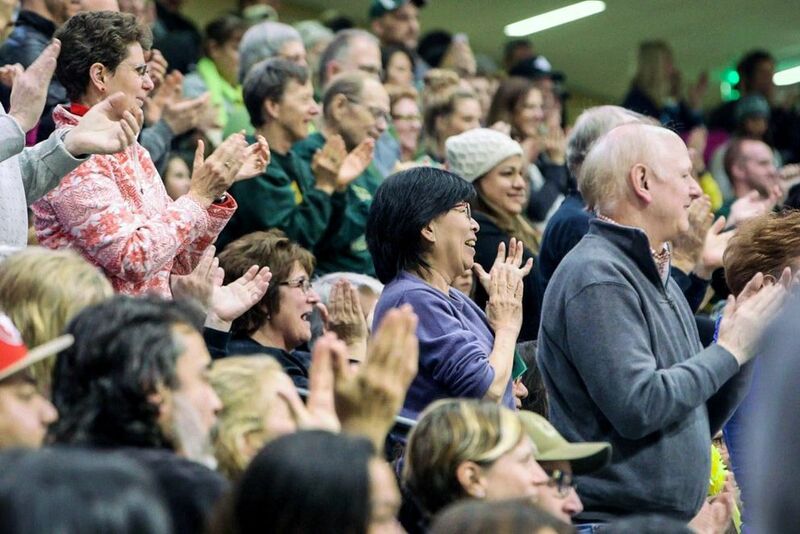 UAA student body president Sam Erickson, who said he grew up a Seawolves hockey fan and supports athletics, cautioned that the community's response to the athletics report was important but can't be allowed to drown out other voices. "I want to ensure that the loudest voice in the room — while certainly an important voice and one that we ought to listen to — does not alter decision-making efforts at the state level, such that decisions for other major academic programs are made in haste, or in a hurry,'' Erickson said. UAA women's basketball coach Ryan McCarthy told of seven players on last season's team who were the first in their families to attend college. He asked Johnsen if he recognized the value of sports. "I get it, I really do,'' Johnsen said. "I played college sports, my son played D-I college football. Understand the value of it — I really do.